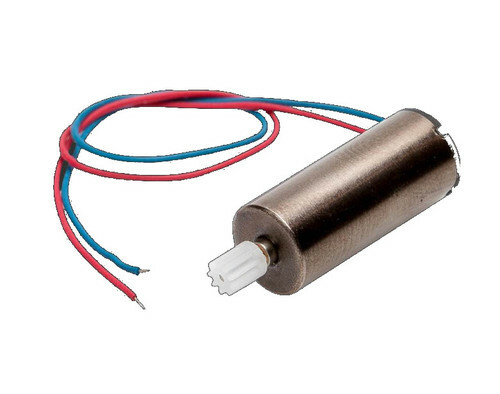 A 4mm dia x 8mm length coreless motor designed for 3V operation. Weight 0.52gm and with 0.6mm shaft and 60mm leads. Motor for GB05 gearbox with 42mm wire lead length and about 1.5mm tinned ends of wire. As used on Butterfly RTF's and other models that use the GB05 gearbox. Weight 0.65gm and with 0.7mm shaft. Coreless motor. Good match with the Micro Butterfly propeller, or GB05 gearbox or hundreds of other projects. Use with the Vapor PKZ3327 gearbox. Replacement 6mm coreless motor and pinion for the Parkzone Micro J-3 Cub. Fits the PKZ3928 gearbox. Available optimised for CW and CCW operation. All have 80cm leads with Molex Picoblade plug. 8.5mm coreless motor as used on several Parkzone micro models. Fitted with 2 pin 1.27mm pin space plug and pinion compatible with PKZ3624 gearbox. The Parkzone P51 and E-flite Micro 4-Site motors are the same specification (20mm long) and have the same pinion. The difference is that the P51 motor has approx 100mm leads and the 4-Site motor has approx 130mm leads. The E-flite EFLU5152 is 23mm long and runs at a slightly higher power than the other 2. Some items are currently out of stock. Please email if you would like to be notified when they are back in stock. 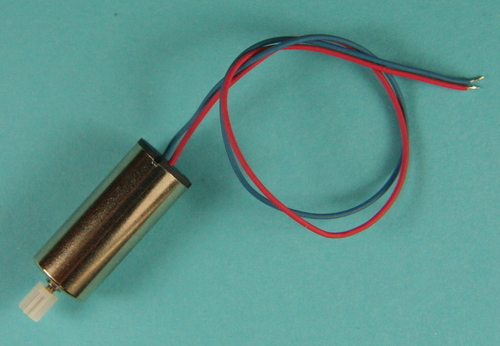 8.5mm coreless motor as used on the E-flite Micro Radian glider. Fitted with 2 pin 1.27mm pin space plug and pinion compatible with EFLU2927 gearbox. A superb high power replacement 8.5mm motor for Parkzone and E-flite gearboxes - complete with 9 tooth pinion. This is a drop-in replacement for the motor in most Parkzone and E-flite Ultra Micro models and will give a marked performance improvement. Alternatively, mate it with the Parkzone PKZ3527 or E-flite EFL9053 and EFLU2927 gearboxes to power your own model; available fitted into a PKZ3527. Specification: diameter 8.5mm, length 20mm, weight 4.9gm, shaft 1mm dia 5mm long, speed 15,000Kv, voltage 1.5V - 4.2V, life 5-6 hours. No load current on 4.0V = 0.23A, static load current in PKZ3527 gearbox with EFL9051 prop = 1.95A at 3.8V, 2.2A at 4.0V. 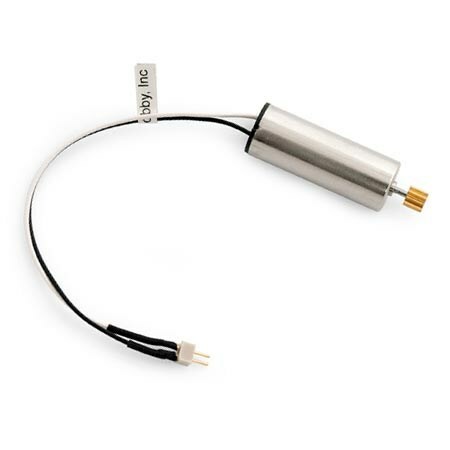 Motor leads are 115mm with bare ends. Suitable 2 pin 1.27mm plugs (compatible with the ESC socket on AR64x0 and PKZ335x receivers) are available here. An insanely powerful 8.5mm motor with 9 tooth pinion. Compatible with Parkzone and E-flite gearboxes. With speed rating of 17,000Kv, this motor puts out more power than any other coreless motor of this size. Make sure your batteries and pilot skills are up to the challenge! Specification: diameter 8.5mm, length 20mm, weight 4.9gm, shaft 1mm dia 5mm long, speed 17,000Kv, voltage 1.5V - 4.2V, life 5-6 hours. Direct drive versions of the CL-0820-15 and CL-0820-17 motors. Available optimised for CW and CCW operation. All are 8.5mm diameter, 20mm long and with a 5mm long 1mm diameter shaft. 4mm 13 ohm motor + 5:1 gearbox with 0.2 mod gears. Draws about 150mA with the 3222 CF prop attached. Weight with motor is 0.86 grams excluding prop adapter and prop. GB05 includes a prop adapter but no prop. 6mm 4.5ohm motor + gearbox. 5.25:1 gear ratio - 0.25 mod gears, 1mm shaft. Long motor leads 6cm and terminated with .05 pin connector. Good for props measuring 4 - 6 inches. Pulls about 200mA or so - depends on the load. 2.29 grams total weight. Replacement gearbox for the Parkzone Micro J-3 Cub. Weighs 0.7gm. Uses PKZ3916 6mm motor and the PKZ3901 prop. Also compatible with the Vapor motor PKZ3316. This motor/gearbox is used on many of the Stevens Aero and Mountain Models micro model kits. The recommended prop is the 4-Site Prop (EFL9051) (pack of 2) or P51 Prop with Spinner. GWS micro speed 5x3 and 5x4.3 props can be used with a 1.5mm prop adapter. A PKZ3624 and EFL9051 prop weigh approx 8gm and will produce approx 30gm thrust. If this motor/gearbox is out of stock, a unit may be built using the separate gearbox and 8.5mm motor. A high performance 8.5mm coreless motor and gearbox with extended propshaft. Ideal for models with dummy engines mounted in front of the gearbox. Identical dimensions to the Parkzone PKZ3624 with EFLU3004 prop shaft. Weighs approx 6.5g. Motor is fitted with 2 pin 1.27mm spacing connector. A spare gearbox for the Microaces power unit. Takes any 8.5mm coreless motor with 9 tooth pinion. Replacement gearbox for several Parkzone models, as used in PKZ3624. Gearbox output shaft is 1.5mm with a threaded end. Used with the PKZ3616 creates the same setup as the PKZ3624. Alternatively use a higher power motor like the CL-0820-15-9T or, for more power, the CL-0820-17-9T (if you are crazy enough). Replacement gearbox for several Parkzone models. Gearbox output shaft is 1.5mm with a threaded end. Replacement gearbox for the E-flite Micro Radian and the Radian folding prop (EFLU2902). Takes a 8.5mm coreless motor - ideally one of the higher power versions (EFLU2916, EFUL5152 or CL-0820-15-9T). Gearbox output shaft is 1.5mm with a threaded end.